Tooth extraction is a standard procedure that is undertaken by dentists globally. The time it takes for a dentist to pull out a tooth can be anywhere between 10 minutes to 2 hours. It depends on various factors such as the type of tooth and its condition, the dentist’s experience, and the patient. Tooth decay is a common reason for extraction of teeth. Patients who suffer from this condition have avoided going to the dentist for an examination and cleaning for a long time. It normally takes years for tooth decay to reach a point of extraction. In the early stages of tooth decay, it usually affects the tooth enamel. After it wears off the coating, the dentin which is the inner part also begins to be infected. Consequently, there is a hole in the center of the tooth causing more damage. The bacteria will eat through the tooth until it reaches the pulp resulting in a root canal infection. If the patient does not seek treatment, the infection will eventually extend further causing more damage to the tooth. At some point, the tooth cannot be saved and a dentist may recommend tooth removal followed by treatment for restoration. 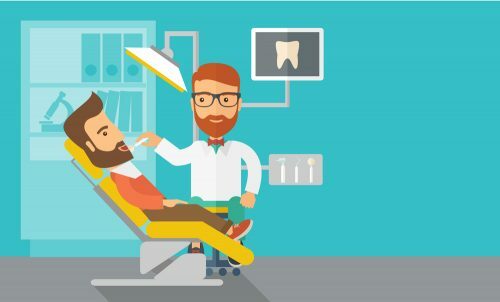 This is why it is wise (and common in most Western countries) to visit a dental office twice a year for teeth cleaning and regular examinations. Do not let tooth decay be the reason why you lose your teeth. Learn how to effectively strengthen your teeth by developing some healthy habits. Physical injuries to teeth due to an accident or otherwise may be a reason for an extraction as well. The teeth may be severely broken, chipped, or cracked. This may damage the gums, and as a result, tooth removal may be necessary. Restoration of the natural tooth with a filling or a crown is typically preferred. However, extraction is the last option in serious cases. Some patients prefer to replace damaged teeth with dental implants which are placed into the jaw. The natural tooth has to be removed entirely for implants to be set. Periodontal disease is also known as gum disease. It is a leading cause of loss of teeth in the U.S. Periodontal disease occurs when the gums separate from the teeth and create pockets that eventually get infected. The bone and connecting tissues which keeps teeth accurately in place break down from toxins coming from bacteria. The patient has to seek medical attention immediately. If not, the tissue, bones, and gums become loose and damaged. Extraction will be required later. READ MORE: Tooth extraction healing – all you need to know. They may grow at a wrong angle. You have a small mouth, and your jaw cannot accommodate more molars. You are suffering from gum disease or cavities, and your wisdom teeth are unreachable. The teeth may be impacted and trapped in your gum or jawbone. The extraction procedure for wisdom teeth takes a maximum of one hour after the gum is numbed using general anesthesia. When a baby’s teeth begin to decay, or they are damaged. Tooth extraction may be an option to eliminate the pain and save the gum. However, removing the tooth early before a permanent tooth erupts may cause other teeth to fill that gap. If extraction is unnecessary, an orthodontist may recommend other ways to fill the gap until the permanent tooth erupts. Extracting milk teeth helps the dentist in guiding the development of permanent teeth. As a result, surgeries and straightening procedures that might have been performed later are avoided. Removing milk teeth takes 15 minutes after the dentist has administered an anesthetic to numb the gum and bone. Extractions from the upper jaw are fast because the maxillary bone is spongy. It is also easier to numb the maxillary bone. However, the lower-jaw teeth take much longer to extract because of the mandibles extremely dense bone. Tooth extraction does not need to scare anyone. Dentists use strong general anesthesia to numb the gum to keep pain at a minimum level. Remember to visit your dentist after every six months to avoid unnecessary tooth extraction.